Absinthe 3 x 10 ML E-Juice by Amazonia: Yet another winning combination from Amazonia: this time it's a cocktail of blackberry and absinthe: wonderfully wicked. Absinthe 3 x 10 ML E-Juice by Amazonia is part of the new range by the leading UK manufacturer. It is a 76-24 (VG/PG) mix and is available in Zero mg (0%), 3 mg (0.3%) and 6 mg (0.6%) nicotine strengths and it produces great cloud. 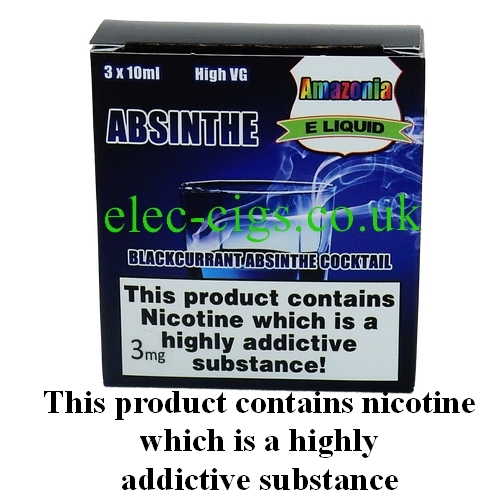 Absinthe 3 x 10 ML E-Juice by Amazonia is for sale to person aged 18 and over only. Please note that 'Spring Vapour' has changed its brand name to 'Amazonia': it is still the same juice, just the brand name is changing. We apologise for any confusion caused.